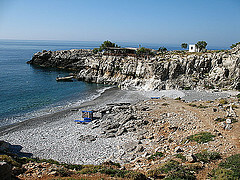 Marmara (marble in Greek) or Dialiskari is a beautiful pebble beach in a small secluded bay reached only by foot or by boat, located at the exit of the Aradena Gorge, about a 45-minute (5 km) scramble west of Loutro in Sfakia region, southern Crete. It It is named after the light colour rocks of the beach that look like marble. There atop a low cliff over tiny, pebbly Marmara beach, is a charming little taverna. It is a great place for mezedes, souvlaki or fresh fish, washed down, naturally, with a glass or several of retsina or raki. If you are too stocious to negotiate the path back to Loutro, just wait until evening for the taxi boat back to Loutro. I am not sure the taverna even has a name, but that hardly matters as it is the only one on the beach. If you find yourself in Loutro and you are fit enough for an hours walk we highly suggest a hike to Aradaina gorge and Marmara!